I’ve been a fan of Stephen King’s work almost as long as I’ve been alive. From watching The Shining at a friend’s house at age 3 and a half, to doing a book report on Christine in 5h grade, to tearing through as many of his books as I could in my late teens; not many things have been constant throughout my life, but Stephen King has been. One thing in particular that I’ve enjoyed about his work throughout the years is that most of the films that have been made of his books are reasonably true to the books themselves. Granted some parts are cut in the interest of film flow, and some dialogue is changed a little here and there, but each of the films based on his books is recognizable enough not to upset most discerning readers. 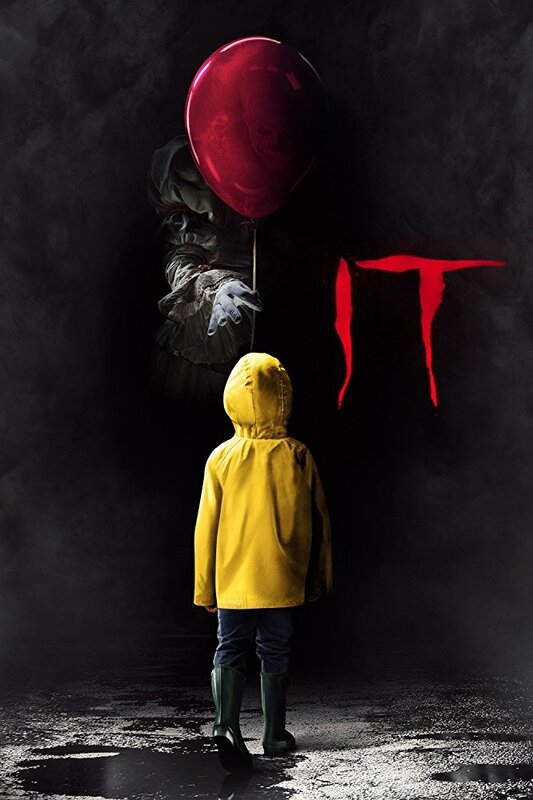 For those who don’t know, It is about a group of seven friends who live in the fictional town of Derry, Maine and band together to fight an evil clown who abducts and eats children every 27 years. Do a quick Google search of how true this film is to the book and you’ll find dozens, if not hundreds of articles, all containing spoilers, and all containing roughly the same assessments. In the interest of not wanting to rehash these solid conclusions I’ll be avoiding that talk, and getting straight down to my judgment of the movie itself as a standalone entity. Given that there are so many main characters (seven, plus the bully, little Georgie, and It itself), it would take too long to scrutinize each performance separately, so I’ll only note the performances that truly stuck out in my mind. As a whole, I feel that Rich Delia, the casting director, made superb choices when it came to filling each of these roles. Each kid chosen to play one of the Losers seemed to become their characters, making the believability factor pretty high on this one. And they seemed to have the onscreen chemistry of old friends, which can be hard to pull off with such a large group, whether they’re kids or adults. Taking a closer look, I enjoyed the performances of Sophia Lillis, who plays Beverley; Jack Dylan Grazer, who plays Eddie; Jackson Robert Scott, who plays Georgie; and Jaeden Lieberher, who plays Bill. Sophia, as Beverley, gave the character a strength and fearlessness I’m sure was clear in the book, but wasn’t so obvious in the 1990s movie. Where Emily Perkins played Bev as a rather mousy and damaged young woman, Sophia seemed to take the horrible things that happened to Bev and use them as fuel for her courage and tenacity in standing for what’s right. Sophia played the character as more of a leader than just another part of the group, which allowed her light to shine brightest among the other performances in the film. Jack Dylan Grazer, as Eddie, was phenomenal. I’m sure it’s difficult to accurately play a hypochondriac, but Jack pulled it off beautifully. I have no idea as to the motivation director Andy Muschietti gave beforehand, but Jack ran with it. Portraying this character as fast talking and afraid of literally everything (right down to contracting AIDS from a handrail) was a great choice on his part, and was very well done. Although I know I just said that Sophie was the light that shined brightest of all the kids, but it’s the performance of Jackson Robert Scott that sticks out as the best in the film in my mind. Jackson wasn’t in the film for long at all, but the scenes containing him were all meant to be horrific and chilling. I imagine that as a child of nine, (I have no idea how old he was during filming) it was both difficult and scary for him to play this role. If he did have any fear during filming it certainly did show up in the finished product, and for that I commend him. Lastly I’d like to examine the performance of Jaeden Lieberher as Bill. Of the children in this film, Jaeden ties Wyatt Oleff (who plays Stan) for the most acting credits at 13. But where Wyatt’s only other big role is as a young Peter Quill in the Guardians of the Galaxy films, Jaeden has had quite a few other big roles. He’s also played Oliver in St. Vincent, Alton in Midnight Special and Henry in The Book of Henry to name a few. Of course, having bigger acting credits under your belt doesn’t guarantee that you’re good at acting, but in Jaeden’s case it’s proof enough that he’s got what it takes to go pretty far in this business. As Bill, Jaeden showcased his talent as a born leader. He took this character, who has lost so much in life, and elevated him to be the glue that holds the group together in a way that Jonathan Brandis couldn’t quite pull off in the 1990’s version of the film. I must admit, I’m excited to see whatever this young talent does next. As a whole this version of It, same as the 1990s version, was only so-so in my eyes, but they’re both not so great for different reasons. The problem I have with the 1990s version is its general cheesiness and overall poor acting. But it is also the cheesiness and poor acting that makes it great, and worth watching whenever it’s on TV. In comparison, this most recent incarnation of It just wasn’t scary. Special effects have come an infinitely long way since the 90s, but even they couldn’t save this film. Sure, there were some creepy bits, like the lady that came out of the painting, but for the most part I was laughing when I was supposed to be scared. There’s just something about the way things were done in this version of It that made it less horror and more laughable. As I’ve said before, maybe it’s because I’m far too desensitized to this stuff now, or maybe it’s just the thought of a killer clown; but no matter what it is exactly, this is a film that needs to crawl back in to the sewers and stay there another 27 years. It is rated R, was directed by Andy Muschietti and stars Jaeden Lieberher, Jeremy Ray Taylor, Sophia Lillis, Finn Wolfhard, Chosen Jacobs, Jack Dylan Grazer, Wyatt Oleff and Bill Skarsgård. It is currently in theaters and will be released on Blu Ray, DVD and streaming January 1, 2018.